Well, it's been way too long since I've posted. The last month has been a really busy time at work and home computer projects. I'm in the process of simplifying things in my personal projects, so I've been shedding some projects and that is taking some time to do. The key is that I'm still keeping up with my ironman training program. Well, not hitting every workout but just about considering the traveling and racing I'm doing. 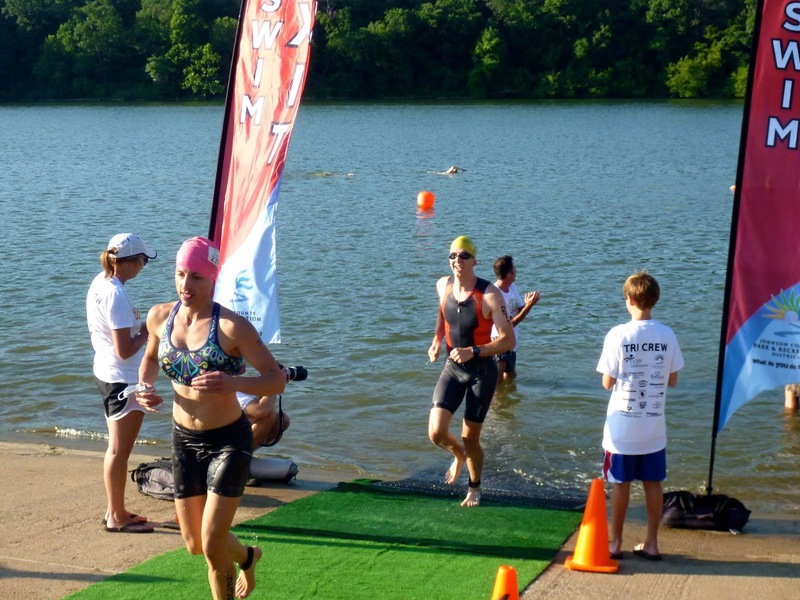 Speaking of racing, this past Sunday was the Shawnee Mission Park Triathlon. It took a while to put this on my list but after a little bit of nudging from Ryan on twitter and Facebook, finally made the plunge. #SMPShowdown was ON. This would be my 5th triathlon at Shawnee Mission Park. KC Corporate Challenge uses this stage for their triathlon. 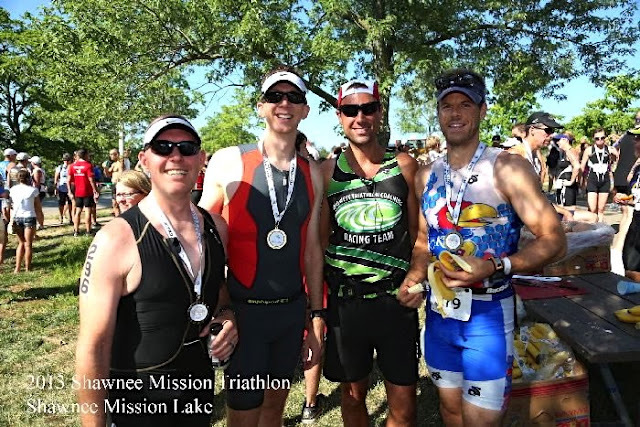 I did SMP Triathlon in 2011 and KC Corporate Challenge in 2011, 2012, and 2013. 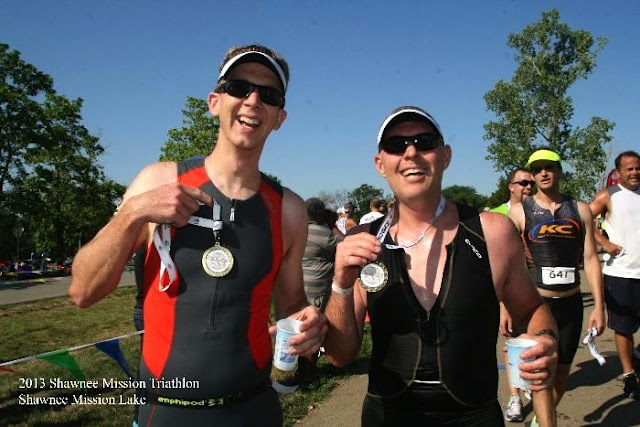 The Corporate Challenge races are sprint distances but I did the long distance in 2011 with the SMP Tri. OK. So we've both got some tired legs. Fair enough. Due to my crazy work week leading up to the race, I actually didn't do my normal carb loading meals. With only a 2 hour race, I figured I could manage my fuel during the race day but I did have a huge serving of pasta on Friday and a bunch of pizza on Saturday. That counts, right? Saturday I tried to keep a bottle of water in my hand the entire day and stuck with that instead of beer Saturday night while spending time with Joe VI and crew. I wasn't real pleased with being rushed at Tinman and KC Corporate Challenge Tri for my pre-race setup early this year, so we got to the race site around 5:45am. Transition closed at 6:45, so that should give plenty of time to prepare and mingle. As expected, there was a bag check. They didn't bother with my bike bag this time, thankfully. The transition spots were marked by Bib # and I got a nice spot right in the middle of the row. Since there were two racks per row, this gave me a little extra room plus I was able to put one of my bags on the end of the rack structure as a nice little flag to find my bike. Brian and his wife Jill came over as I was setting up and we chatted a bit. 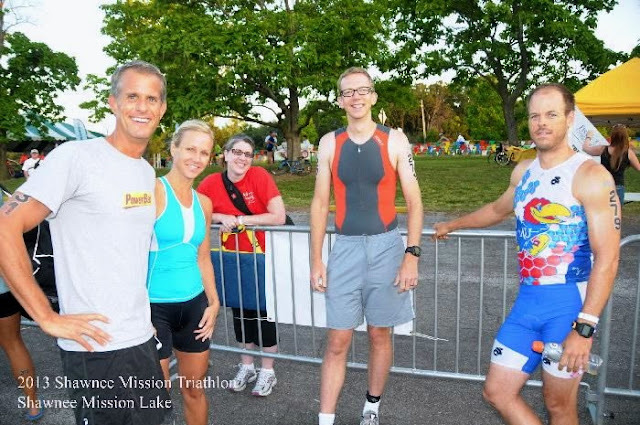 This was Brian's first triathlon since moving to KC as well as Jill's first long distance triathlon! They started in the first 2 waves while I was in the last wave of the long distance race. I ended up racking up a few spots from Ryan, so we chatted a bit. After a bathroom break, it was about time to head to the boat launch, where I waited with Drew. Wow. Checkout that sun. That surely won't be a problem on the swim. By the time we got to the boat launch, the race had officially started with the Challenged Athlete division. There was an athlete missing a leg and another missing an arm. I'm sure their swim times would be better than mine. It's really inspiring. In addition, there were two teams in which the swim was pulling a child in a boat. After exiting the boat, the child was transferred to a trailer to be pulled by bike and then pushed in a running stroller. These were children with Cerebral Palsy. This year United Cerebral Palsy become the title sponsor of the race. Eventually we took off for the swim to the beach start. Just like KC Corporate Challenge, there was a time trial start. Drew and I had lined up together but there was an odd person in line before us, so I stepped up and started about five seconds in front of Drew. Ryan ended up taking off about 20 or so seconds before. He's a faster swimmer, so my hope would be to catch him on the bike or run. The swim wasn't too bad in terms of bumping into people. I had to contend with a few people but soon got into open. I tried to push the pace but not too hard where I'd be dizzy coming out of the water. After about 750 meters, I could tell the water had gotten a bit choppy. Nothing horrible but not as stable. We soon turned back to the the marina where I quickly realized I was in trouble. Sighting for the beach was horrible due to the glare of the sun. Looking forward wasn't possible so I kept the line of buoys in sight on my right. I naturally breathe on my right; however, I decided to look on my left side to see where the marina docks were. They were probably 100 meters from the finish. At one point I looked and was about 5 yards from the shore line! ACK! It was actually just a narrow part of the course but freaked me out a bit. I soon caught sight of the swim exit flags and pushed for it! Super long run up the parking lot to the swim. I found my transition area easily with my bag on the transition rack. What else was on the transition rack? Ryan getting ready for the bike. I thought about yelling at him but decided I'd see if he would notice me. Didn't want to motivate him any more than necessary! I thought my transition was pretty fast, so very happy with it. Getting started on the bike. By the time I was running to the mount line with my bike, Ryan was gone. Not sure how quickly he got out but TKB yelled to say I was less than a minute behind. 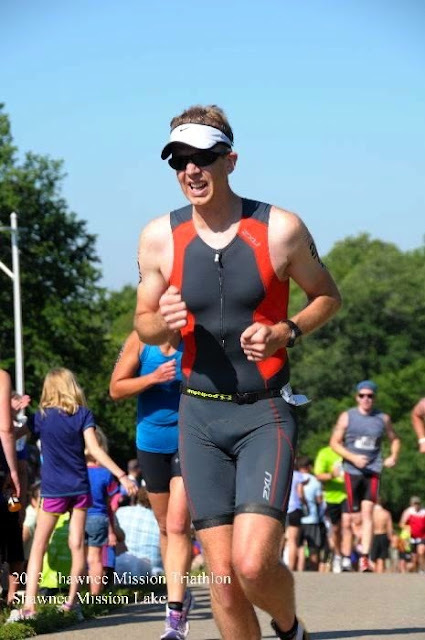 Fortunately, Ryan wears a KU Jayhawk tri kit, so he's pretty easy to spot. I probably shouldn't give him that information! The bike is four laps around the SMP lake. I figured my first lap would be slow, second lap faster, third lap will be pushed to the limits and fourth lap preparing for the running. I ended up catching up with Ryan in the first major hill of the race but kept my distance. After about another mile, I pushed past Ryan. I hoped to not see him until well after the turn around on the out and back portion of the run. 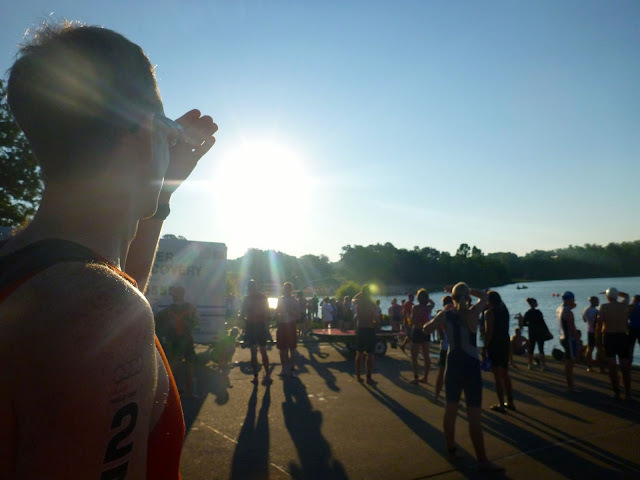 Now it's time to focus on something I should have been doing the whole time, swim/bike/run MY race. Waving at TKB after lap 2. Whether it's good or not, I've noticed I do something different than most people on hills. When in the rolling portion of the hills, I tend to pedal through the downs HARD in order to garner enough speed to push me most of the way to the top of the next hill. Sure, going downhill is free speed but I feel that the energy expended pushing on the downhill is less than if I were to crush my pedals on the uphill. Maybe that's just me but it seems to work. I ate a quarter of a Cliff bar on the flat portion of lap two and a chomp on the flat portion of lap four. I successfully completed a flying dismount and off to transition 2. I feel like the only thing I can do after dismounting my bike is run hard. I love it. Racked my bike and off to the run. 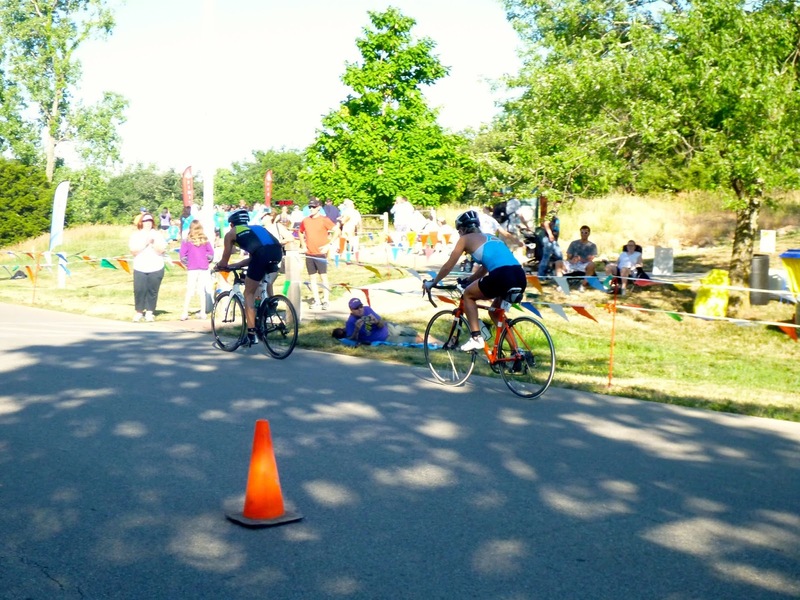 There is a 90 degree turn out of the transition and during this triathlon and KC Corporate challenge, I almost fly out too hard and hit the barrier that keeps people on track out of transition. I'm probably burning too much energy here but it feels good. Still pushing hard and trying to setup myself for the dam(n) hill. We are talking about an 18 precent incline that you ride four times and then run it. I simply kept pushing and kept passing a bunch of people. In fact, no one had passed me yet in the first mile. Let's see how long I can keep this going. I had even passed someone in my age group! At around 2 miles you start an out and back. 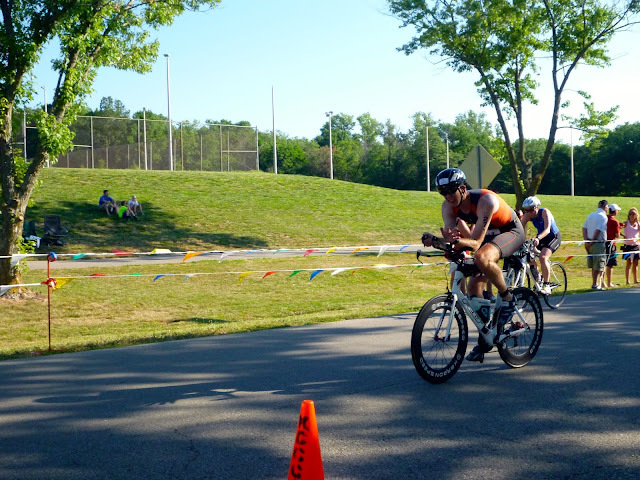 After quite a ways on this, I hadn't see anyone in my age group coming back from the turn around. Nice! Eventually I saw some heading back from the turn around and immediately counted 3 people. So I am not getting a podium. Again, let's focus on my race. I hit the turn around at roughly mile 3. It was at this point I got passed for the first time. It was someone in the youngest age group. He was crazy fast. He was also decidedly wearing running shorts, so I wondered if he was part of a team? Either way, there was no way I was catching him. So as long as no one else passes me, then perfect. After the turn around I started keeping my eyes open for that KU tri kit of Ryan's. After about a minute and a half I saw him. Gave him a wave and just kept booking it because there was still another battle ahead. Leaving the SMP trail system requires another huge hill to be climbed. In the past I have even walked this section thinking I could walk it fast than run it but I kept moving. Eventually it leveled out and had about half a mile to go. There was another uphill and then a nice downhill. About a .10 of a mile before the finish there is a 30 foot incline. There were about 8 or 10 people in front of me and I just kicked it HARD. I passed everyone in that group and finished the race alone. I had heard about 3 or 4 people cheer me on as I finished, which was pretty cool but I was so narrow sighted I don't remember who all it was. This is what 5:30 pace looks like after racing for 1 hour and 47 minutes. One of those voices was Drew! I had forgotten about him on the course. I had passed him in the group of runners. As it turns out, even though I crossed the finish line before him, he actually beat me by 1 second. Remember when I mentioned he started in the set of swimmers behind me for the time trial start? That means his chip time started 5 seconds after me. I had crossed the line only 4 seconds ahead of him so I didn't make up those 5 seconds of chip time. Now if anyone questions me spending $$$$ towards my gear to gain a few seconds, now you know why! That guy that passed me around mile 3? I saw him writhing in agony at the top of the hill out of the trail system. From what I could tell it was some MAJOR cramps. That's what happens when you pass me. You've been warned! The weather turned out to be perfect so that helped out with my race. I remember it being crazy hot two years ago and pushing myself on the run only to get to the next shady spot. Since I had my selfish goal of finishing ahead of Ryan, I managed to meet that goal but I also stayed under 2 hours. In fact, I beat my time from two years ago by 13 minutes. The bike and race wheels (which Ryan set me up with) definitely helped even though the hills on the bike course. My run time improved by 4.5 minutes simply because I am a much stronger runner these days. This is definitely attributed to my marathon training from last year, but I also feel STRONGER on the run. This is attributed to my focus on strength training this year (Thanks Sam!). Ryan is a great guy so I hope he takes my ribbing as tongue-in-cheek. We're both in the middle of ironman training (he's doing the new Ironman Tahoe in September). I'm sure that if we both trained specifically for the same race, he'd have me easily. But... for the record... in triathlons I am 2 and 0, but who's counting? 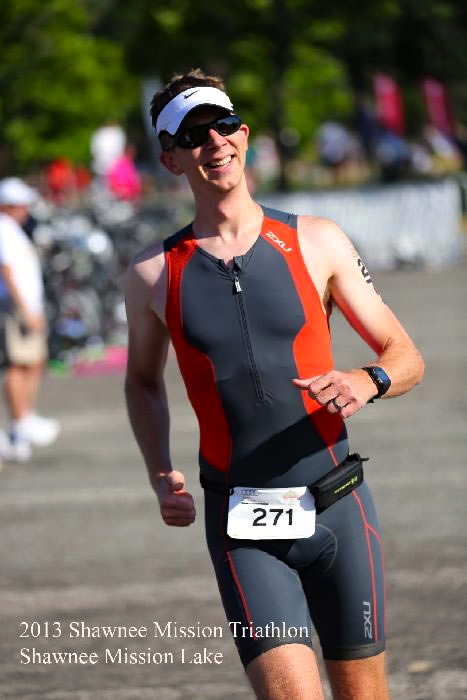 Ryan has started a triathlon coaching business and doing this full time, so check out him out if you are looking for some coaching! 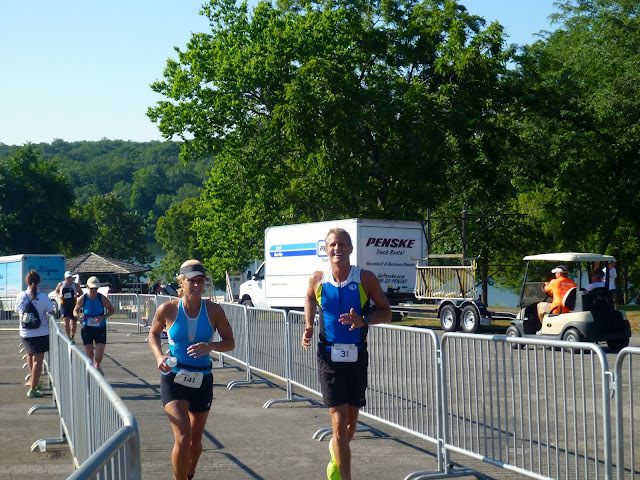 After engorging on post race food (banana, chocolate milk, gatorade, pop), I met back up with Jill and Brian. Brian managed to wait for Jill in the water. They had raced together the entire time. 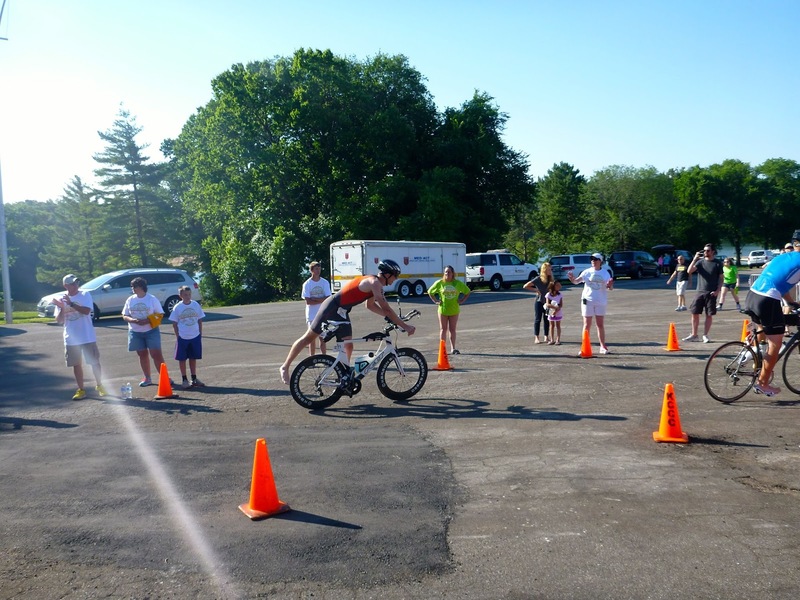 Talk about triathlon chivalry! On our way over to the post-race pancakes by Chris Cakes, I saw Mark from twitter. He managed another podium spot in the short distance race, which he has done every year he's participated in this. Two 2nd place and a third place. They have a nice looking trophy, so his mantel is getting pretty full. His fiancee participated in her first triathlon here as well. Plenty of triathlete couples representing this day. 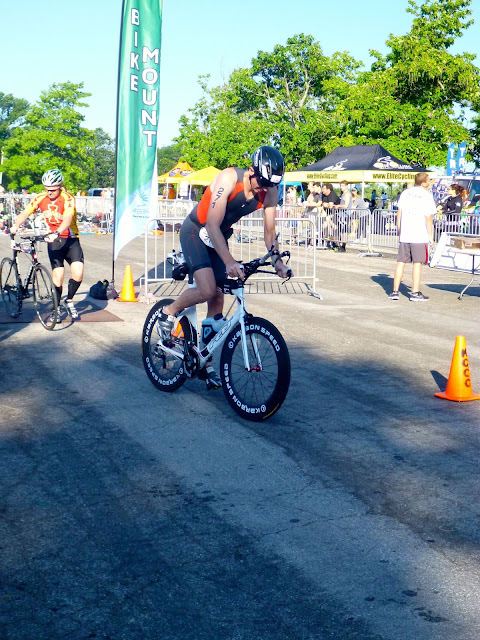 In a story of what could have been, my sprint distance time for KC Corporate Challenge a few weeks earlier was 1:02:02, which would have placed me 2nd in the age group of the sprint distance triathlon on Sunday. This baffles me since I didn't get anywhere close at KCCC. Post-race... evaluating Ryan's banana consumption technique. OK, maybe not. Brian and Jill.. on the bike! Jill and Brian.. on the run! Nice Race! See you this weekend!